The looming threat of melting sea ice has raised awareness about climate change's impact on polar bears, an endangered species. Also relevant—and less studied—is how changes to the earth—and melting sea ice—could affect the species' diet. Which may be why a recent study in the December issue of the journal Polar Research that establishes two different primary food webs for polar bears and documents surprisingly higher mercury levels in bears that eat from one specific web garnered interest from both the scientific community and science journalists. Mercury concentrations can be poisonous to humans and other members of the food chain; currently scientists do not know what levels of mercury are dangerous to polar bears. The research went further, analyzing mercury concentrations in the bears’ fur. They found that polar bears chowing down on the phytoplankton-based food chain, which originates in the open ocean in the absence of sea ice, had greater concentrations of mercury in their bodies than bears whose diet traced back to the ice algae. One of the study's authors, Joel Blum, the John D MacArthur Professor of Geological Sciences, and Professor of Ecology at the University of Michigan, said the findings are significant as scientists strive to learn more about mercury, an inorganic element whose presence in the atmosphere has tripled since the industrial revolution. "Very little is known about how mercury moves around the globe," said Blum. "But we know humans have increased the amount of mercury in the environment." Mercury can stay in the atmosphere for up to a year and travel to far reaches of the globe, and scientists have documented a considerable amount of mercury deposited in the Arctic. Studying the bears provides important background data on earlier mercury levels, Blum said. 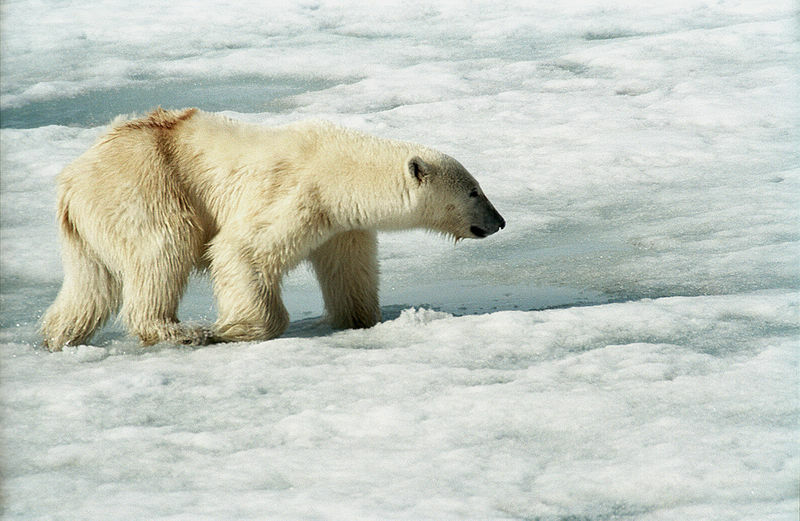 Blum and his colleagues analyzed mercury concentrations in polar bears that predated 1950, before the major influx of mercury from coal-burning power plants and other industrial activities that send mercury into the atmosphere. Specifically, they analyzed the late-19th- and early-20th-century polar bear hair for the chemical signatures of nitrogen isotopes, carbon isotopes, and mercury concentrations, looking back in time to a period before man-caused mercury emissions escalated. "We know that due to human inputs mercury distribution in the Arctic is currently heterogeneous (multi-faceted and complex), so we decided to take a step back and understand the fundamental processes, pre-1950," said Blum. The discovery that bears that eat on the phytoplankton food chain have significantly higher mercury concentrations suggests that as sea ice melts and bears eat more phytoplankton-based diets, their mercury concentrations could increase, said Blum. And, he added, if concentrations of mercury are increasing in polar bears, which are at the top of the food chain, "this is an indication that they are also increasing lower in the arctic food chain." That means human populations that rely on subsistence hunting could also be experiencing an increase of mercury exposure as well. Relatively harmless in its inorganic state, mercury becomes extremely poisonous to humans when it is converted into methylmercury and passed up the food chain. Mercury in its methylated state is considered by many to be "public enemy number one," said Blum. Its prevalence in the Arctic and potential to spread through the food chain is a very real concern and could be exacerbated by climate change. Recent discoveries about mercury's biochemical properties have unlocked mysteries about the element and enabled scientists to probe deeper into the question of how a relatively inert element (mercury) can transform into a menacing poison. Scientists know that at times there can be extremely high concentrations of mercury in the Arctic snow pack and are working to understand where it is coming from and what unique chemical reactions take place in the Arctic that lead to rapid deposition of mercury from the atmosphere to the snowpack. Now that his team better understands the Arctic food web, pre-1950, the logical next step would be to examine mercury levels and nitrogen and carbon isotopes in bears from 1950 to present day, he said. In addition, much remains to be understood regarding mercury in the Arctic. Specifically, scientists want to better understand where it comes from, how it travels to northern latitudes, what mechanisms cause it to be deposited, and where it is converted to methylmercury.